Some cloth doll makers start out from quilting. After they’ve made a few quilts, they find an interesting cloth doll to add to the quilt display. Usually, these are simple “pancake” cloth dolls with costumes that complement the quilt. Some cloth doll makers start by making Raggedy Ann and Andy cloth dolls or other simple cloth dolls for their grandchildren. Small children seem to prefer “soft” cloth dolls or animals that they can carry around with them. Usually, these are simple, soft, pancake cloth dolls with costumes that match what the children usually wear. Some cloth doll makers find “abstract” cloth dolls as a way to express their creativity. They often start with a design in a sewing, or craft, or decorating magazine, and go on to more and better cloth dolls. If you’ve been making cloth dolls for a while and you are looking for a bigger challenge, a precision cloth doll may be ideal for you. From an artistic point of view, the difference between a doll and a sculpture is the sense of frozen time. A doll is just a representation of a person in a sort of abstract way similar to a 3-dimensional stick figure – it has only the life that the child (or adult) projects onto it in their imagination. A sculpture looks like it is a person frozen into a scene in time that could suddenly start moving and carry on with it’s life. A sculpture has a sense of realism in its proportions, anatomical detail, implied motion, and costume accuracy that makes you feel it is about to come to life. A sculpture creates an emotion of some sort in the viewer – a sense of empathy, curiosity, or anticipation that makes the sculpture more than just an inanimate object. This sense of realism is the difference between an ordinary cloth doll and a precision cloth doll. A precision cloth doll is like a little person waiting to come to life and tell their own story that is implied by the scene that is set. If you want this sense of “life” in your dolls, precision cloth doll making can help you make your work display the transition from object to event. A precision cloth doll can give you a deep sense of satisfaction that you have expressed a story you have always wanted to tell. Mimi’s Victoria Rose 3rd Edition starts at the beginning with Mimi’s Basic Shopping List for Cloth Doll Makers – a separate 30-page booklet that you can take with you to the fabric or craft store on paper, on your smartphone, or on your tablet. It shows you with pictures and descriptions exactly what tools and materials you will need for basic precision cloth doll making. It explains how each dollmaking tool is used and what to look for. If you have a limited budget, or if you’re not sure you want to get heavily involved yet, it tells you which tools to start with and which tools to leave for later. If saves you hours of time and lots of money by helping you get the right stuff the first time and avoiding costly mistakes. Mimi’s Victoria Rose Shopping List is a separate 3-page list of the exact supplies and materials you need to make Victoria Rose. Again, you can take it to the store with you on paper, on your smartphone, or on your tablet. Mimi’s Video Handbook for Cloth Doll Makers consists of 13 how-to-do-it videos that show you step-by-step how to do all of the little tricks and techniques that make dollmaking easier and more fun. These are the sewing tricks that you usually only learn by taking an in-person class with a master teacher. You learn not only the easiest and best ways to create dolls and clothing, but also in addition to the “how,” you learn the “why” for each technique, what mistakes to avoid, and how to fix it if you make a mistake. Sewing Machine Basics – how to set up your sewing machine and what accessories make dollmaking easier. Machine Stitching Techniques – how to do critical things like back-tacking and following tight curves. Disappearing Fabric Marker – how to select and use a disappearing fabric marker. Preparing Fingers for Turning – how to trim and strengthen seams around fingers before turning so that the seams don’t rip open. Making and Using ginger Turning Tools – how to make tools that will let you turn fingers easily, and how to use those tools effectively. Wiring Fingers – how to wire fingers so that hands can grasp objects or so that fingers can be individually posed for hand gestures. Posing Hands – how to bend fingers so that knuckles look natural and pose hands at the wrist so that poses look natural. Ladder Stitching – how to join body parts and close stuffing holes so that the seams looks like it was perfectly machine stitched. Hair Wefting Techniques – how to weft fibers and yarns so that hair can be easily attached to the doll and will look like natural growing hair. Face Coloring Techniques – how to color the doll’s face so that it looks natural and realistic. Anatomy: Scale and Proportion – how the parts of the body relate to one another so that dolls look like real humans in miniature. Story: Balance and Motion – how to pose dolls so that they look like they are in the middle of movement – like a frozen snapshot in time. Mimi’s Victoria Rose Instructions have been greatly expanded to 115 pages (56 pages in previous editions). There are more steps with expanded explanations to make it easier than ever to just follow the step-by-step instructions and get a beautiful doll. You can print out the instructions, or you can read them a step-at-a-time on your smartphone or tablet right next to your sewing machine. If you prefer, you can read them several steps-at-a-time on your laptop or computer. No matter where you’re starting from, beginning dollmaker to advanced fabric and fiber sculptor, Mimi’s Victoria Rose 3rd Edition is the perfect introduction to precision cloth doll making. Victoria Rose is an easy-to-make, armatured, 16-inch, free-standing cloth doll. She has a young, full-figured, anatomically-proportioned body with a late 19th Century silhouette. Victoria Rose’s clothing was meticulously researched. Her undergarments consist of a set of combinations (these replaced the chemise and drawers, and had no crotch), a corset, a petticoat, and a bustle pad. (The bustle returned as a pad in the late 1880’s.) Her outer garments are a lined walking skirt, a dickey, (rather than a complete blouse to diminish bulk), a lined jacket, and a beautiful hat. Her Victorian boots are paperclay covered with glove leather. Her hair can be made from either wefted mohair or from textured yarn. Instructions for cleaning and wefting mohair are included. AZW format for Kindle or Kindle PC. EPUB format for most smartphones and tablets. PDF expanded format for large screen laptops and desktops. PDF condensed format for Print. DVD video format for DVD players. MP4 video format for smartphones, tablets, laptops, and desktops. Expanded 115-page instruction book included on DVD (56-pages in 2nd Edition) filled with pictures, drawings, and hints for dollmakers. This pattern can be used for any young, full figured, anatomically proportioned, female character doll. You are licensed to sell dolls made from this pattern. The complete DVD with all files for printing, smartphone or tablet, and DVD or computer video is on sale at 20% savings until New Years, 2018. It makes a wonderful gift for you, and for all of your dollmaking friends. Get it directly from Mimidolls.Com or at DollmakersJourney.Com. Our thanks to all of you for your messages and prayers. 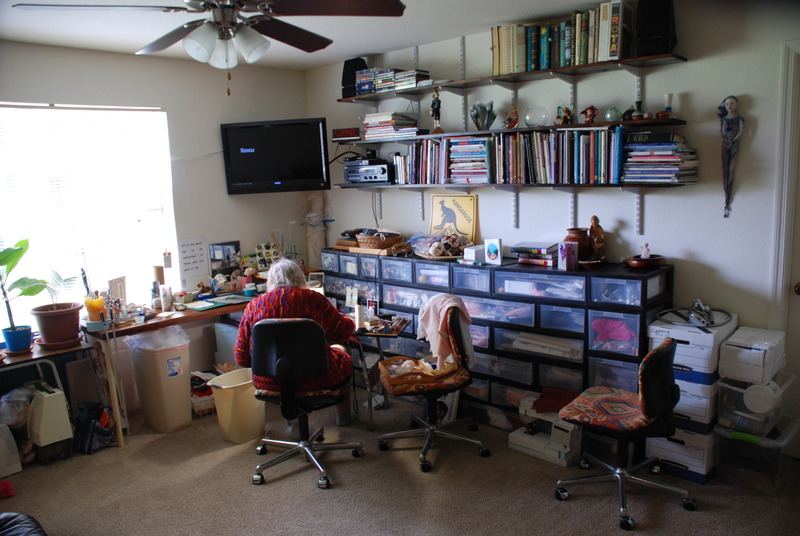 Please forgive me for not acknowledging you individually, but I (Jim) do most stuff now except for dollmaking, and we have just downsized Mimi’s studio and moved to a new, smaller apartment. Previously, Mimi’s colorectal cancer had been inactive in the colon, but not before it had spread to the liver. The latest attempt to kill the cancer involved using radioactive beads inserted into the tumor through a catheter. It was hoped that that would improve her health enough to do a liver resection to remove anything remaining. Abdomen: Most of the (colorectal) cancer in the liver seems to have shrunk to about 1/8 of previous size. It is not very active. Chest: The cancer has metastasized again with two small spots in each lung ranging from 0.4 cm to 1.0 cm. This means that we will NOT do the liver resection to remove the tumor as originally planned, because that would not get it all. On the other hand, the cancer in the liver is much smaller, so the chemo may work better. The spread of the cancer means that we have started chemo again with a new drug. Mimi’ cancer has an identified variation of the KRAS gene which provides instructions for making a protein that is involved in regulating cell division. The new chemo, Vectibix, is a monoclonal antibody that attaches to the cancer cell and makes the cancer cell visible to the immune system. White blood cells then attack the cancer cells. We’re hoping this will do it. Unfortunately, it, too, has some side effects. Mimi is having skin reactions, nausea and fatigue. These side-effects are nowhere near as dangerous as the ones from the original oxyplatin. The doctor will also look into clinical trials as there are new specific therapies for cancers of this type. We’ve moved to a smaller apartment because we need to be on the first floor. Mimi can’t make it up and down stairs anymore because of the chemo-induced peripheral neuropathy from the oxyplatin. We got a slightly smaller place so that it will be easier for me to take care of. This meant that we have had to downsize Mimi’s studio. It’s always painful to let go of things you have spent years collecting. After going through everything three or four times, we’ve gotten down to size where the studio only takes up half of the living room and a large closet by the front door. We’ve given away about 50% of the supplies and about 80% of the books will be for sale on Amazon. Art materials generally went to the fabric artists of the Southwest Florida Fine Craft Guild. Dollmaking specific stuff went to some local dollmakers. More general stuff went to Goodwill. Also, according to the NY Times, in recent years, Wells Fargo has paid more than $10 billion in fines. That includes penalties for subprime loan abuses, discriminating against African-American and Hispanic mortgage borrowers, and foreclosure violations for cars owned by military personnel called to active duty. Wells Fargo was fined 24.1 million dollars for just this item alone. So what did Wells Fargo do to Mimi? When we didn’t get the payment invoice for Mimi’s car from Wells Fargo Dealer Services, I called Wells Fargo customer service to verify that they had received our change of address. Wells Fargo wouldn’t talk to me. They insisted on talking to Mimi, even though I told them she had cancer and wasn’t feeling up to talking on the phone. So they grilled her for several minutes for the answers to the same identification questions that I had already given them the same answers to. I personally think it’s obvious that Wells Fargo thinks it can abuse its customers in every conceivable way. I recommend that anyone who is a Wells Fargo customer find another bank or car finance company. Don’t do business with anything that says Wells Fargo. You can’t trust any of the big banks! They are all out to maximize profits at the expense of customers! What to do? There is something you can do t help! Put your money in a Federal Credit Union. By law, Credit Unions aren’t allowed to do anything except consumer banking. Accounts are insured to the same level as FDIC insures the big banks. Find one near you at Credit Union Access. We use SunCoast FCU. The auto financing rates are around 2% instead of 7% or more. (We got the car before we moved from NJ to FL, so we weren’t members then.) Their mortgage rates are lower too. Look into it yourself. Tell your friends about it too. It’s time to abandon the big commercial banks that are doing such a bad job for the little guys like us. We just got the results back from the latest PET scan. The tumor seems to be dying from the inside out. While the overall size hasn’t decreased, the interior of the tumor shows significantly less activity. Apparently, the outside of the tumor will collapse eventually as the interior is cleaned away. This appears to be the result of the Avastin preventing new blood vessel growth. There are no signs of cancer anywhere else. The doctors are reevaluating, and we may do a new contrast CT to determine if it is feasible to try the radioactive beads to kill the rest of the tumor and then surgically remove the remains. Over the last few weeks, Mimi has been feeling better, but she has been having a down week this week with both nausea and pain. It looks like it will be a little bit better going into next week. Mimi & I are working on a new e-book that will take you behind the scenes at Mimidolls. It will tell you a lot about Mimi and me, and show you how we create a new workshop including why we do it the way we do and which tools we use to get it put together. It should be available here in a few days.